Rutabagas are not well understood, nor widely eaten, and this is a shame. I admit they look and smell ghastly when raw. In fact, never eat it raw; for you will not pick it up ever again! When cooked, however, Rutabagas endures an alchemical transformation into a delicate color and sweet flavor. Rutabagas are fall/early winter root vegetables with a very long growing season. As such they are picked only once during the year - in the wintertime. They weather frost well and, like Kale, sweeten up after exposure to frost. Rutabagas store well in cool, dark places, lengthening the availability at market. Since they are not well used outside of commercial food preparation, rutabagas are quite hard to find. Some supermarkets may carry them, but they sit forlorn and overlooked. Best to seek out a discerning specialty food market. The Rutabaga is actually a hybrid of a turnip and a cabbage. Don’t hold that against it since it tastes like neither. The flavor combination, like any relationship, is complicated - simultaneously sweet and slightly bitter. Since Rutabaga is inexpensive, many chefs use Rutabaga to bulk out recipes: stews, pies, casseroles, or even mash. Rutabaga is a refreshing substitute for the humble potato. Discerning chefs will transform rutabaga into gnocchi, replacing the potato. Rutabaga’s flavor pairs well with gamy meat such as rabbit, or with shellfish – shrimp, or lobster. Resist the temptation to overcook Rutabaga in an effort to remove the raw smell and bitter taste. You can slightly cook them to soften, as in blanching, or you can slow cook them, as in roasting. When blanched they will need more sweetening. My favorite prep method for rutabaga is to peel, chop into rough cubes, steam and puree. I add a touch of heavy cream and a dash of sweetness such as maple syrup, agave nectar, or brown rice syrup; even apple juice. Mix in a pinch of spice such as cumin, cayenne pepper, or paprika and, “Bon Appetit” – a simple, nutritious soup or thrilling pasta sauce. The heavy cream can be substituted for a thick, non-dairy milk such as coconut milk for a Vegan option. In this case, the soup/sauce mix will need to be reduced somewhat to thicken. Growing up in the UK we used large Rutabagas as Jack-o-Lanterns for carving at Halloween. Imagine how long it took poor old Dads to carve that tough baby while their offspring moved onto more immediate distractions. 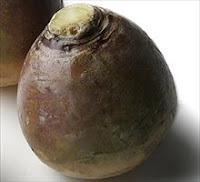 Mother made sure Rutabaga, or, “Swede” as we called it, would be on every Sunday roast dinner plate, and we hated it; that pale orange stuff that had better not touch anything else on the plate! As a ‘grown-up’ I’ve learnt to love this vegetable for its earthy sweetness and adaptability to any kind of use You may not have noticed, but enjoy any kind of ‘pasty’ (pastry turnover) in the UK – Cornish, or otherwise, and you’ve enjoyed Rutabaga – it is the sweet, inexpensive ‘filler’ in pasties. You probably thought it was sweet potato, or carrot. Please try this humblest of vegetables. Don’t be afraid to experiment. It is very cheap to buy, and suits well to just about any recipe you throw it at, just don’t forget to sweeten it. Rutabaga is commonly used in desserts amongst adventurous cooks. See what you can come up with and get back to me! Enjoy 2010: let’s make it a great year for Rutabaga!